It seems to me that delta out / delta in+- is probably not constant with in+- or out. But why should it be? The whole point of an op amp is not to rely on the linearity of the amplifying element for linearity in the output, no? So...maybe if there's a discontinuity? Seems like if slew rate depends on input or output level, that too shouldn't overly affect the output so long as the minimum slew rate is always greater than what you need. Only thing I can think of is offset voltage leading somehow to second harmonic distortion. Or just using the op amp out of its able range (feedback resistor too low / high, etc.). Anyway, a few things (at least the lm4562 data sheet) seem to specify this as an independent parameter. What gives? Is this just cool-aid? One big source of THD (total harmonic distortion) is the output stage of the opamp, usually being totem pole output made with a pnp and npn transistor. The PNP transistor takes care of the negative portion of the signal while the NPN transistor takes care of the positive portion of the signal. When feeding the opamp with a pure sine-wave and one transistors closes before the other one conducts you will see a "flat" part in the sine wave which is dependent of the current thru the output stage, hence of the load applied to the opamp. I'm really beginning to love this site because of things like this. Everyday is a school day! OK, that makes sense. So basically the problem is that at a certain out level, a very small delta in+- has ZERO gain. So the issue is not just that delta out/delta in+- is not constant with output level, but that at times this ratio drops low enough to stop being an op amp at all. So in some ways a THD spec is going to tell me how often the op amp is going to stop being an op amp. Reactive components are also contributors of THD. The proper selection of dielectric of capacitors play a big part. Google Walt Jung Capacitor for very informative articles. the way i like to think about it, is that the opamp isnt an "ideal" opamp. if it had infinite gain, then it wouldnt matter what was going on inside the opamp, as the negative feedback would cancel all that out. but, since it has finite gain, and this gain gets smaller at higher frequencies, the nonlinearities of the internal amplifier stages do play a role. the diffamp stage is pretty linear, but the gain stage and output stages are not. one of the things i used to see on old designs, and not understand, was a pulldown resistor on the opamp output. this was done to pull more current through the top transistor of the totem pole output, and bias into class A, reducing some of this crossover distortion. ALL components introduce some sort of distortion, even humble resistors. For capacitors, google for Cyril Bateman who wrote quite probably the definitive guide to capacitor distortion and its measurement in 6 parts. Op-amps have many imperfections, some of which produce imperfections in the output signal or add unwanted signals into the output. Output crossover distortion is one, and the output biasing resistor that guest mentioned is one way to avoid that by forcing the output stage into Class-A mode. The input stage introduces its own forms of distortion and noise, and there are techniques to minimise these as well. Opamps are not that far away from ideal, I think as a designer there is a lot more that we can do to prevent them from doing their job, than they are doing to prevent us from doing ours. I've been studying amplifiers recently, and I've noticed that almost all commercially available opamps have more or less the same topology, with a single differential input stage, possibly with input protection, or bias cancellation circuitry, taken to a single VAS stage loaded by a current source, then to a complementary PNP/NPN pair for the output. This structure is frequently found in rail to rail amplifiers. 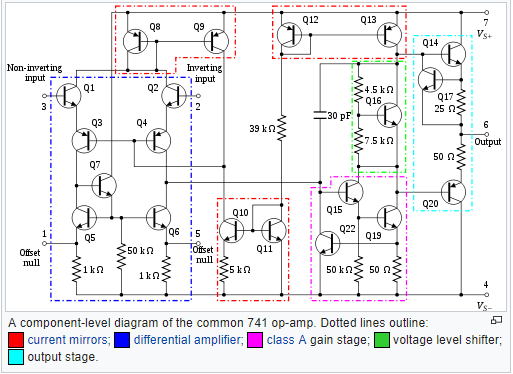 It doesn't seem to change a lot of the parameters we tend to look at, such as DC accuracy, distortion, but it has an elegance to it that the classic opamp topology doesn't, which relies on the high gain VAS stage to do most of the work. One figure that does jump out from that datasheet is the near perfect gain vs phase plot.